[A little background: It had been a few months that I was searching for twin-blade cartridges for the Gillette SensorExcel safety razor that I prefer. I had almost given up on it by now, and was looking towards this seemingly inevitable upgrade to Mach3 or something when I suddenly hit a jackpot - I found a supermarket selling the make and model that I was looking for. I could finally purchase a year worth of supply. The history goes that some hundred years ago, Mr. King Gillette was a wealthy but frustrated failure of an innovator at 40. He had written a book called " The Human Drift ", which argued that all industry should be taken over by a single corporation owned by the public, and that millions of Americans should live in a giant city called Metropolis powered by the Niagara Falls. One day while shaving with a rather blunt straight razor, the idea struck to him that perhaps this reusable razor could be replaced by a 'consumable' razor having the blade made of thin metal strips. Somewhere around 1870, Kampfe Brothers had developed a forged razor of a similar kind, which Mr. Gillette gladly improvised upon, registered the patent for the new design in his name, and the world got it's first safety razor with name 'Gillette'. The really unique and path-breaking piece about this safety razor was not the product itself so much so was the marketing model it assumed, and which I called - the Gillette 'trap'. 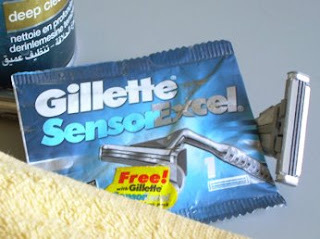 Known as "Freebie Marketing", the business model was to give away free safety razors and make profit by selling corresponding blades for them afterwards. In the initial days, however, this marketing model was the product's weakness for the industrial facilities were not advanced enough to manufacture cheap blades with thin metal strips as mass-production. Mr. Gillette had to struggle almost for a couple of decades more to turn his model truly profitable. That past, the inventor is reaping benefits since than, and the company was valued at nearly USD 60bn in 2005 when P&G acquired it to create world's largest personal care and household products company. The year of 2005 is important for this post also because, after acquiring my new supply of cartridges, I thought of using the one cartridge first that I had been saving for a rainy day for quite some time now. The manufacturing date on this old one is May 2005. But interestingly the retail price is exactly the same as the one I bought today in 2008.